The dreaded homework that student's dislike and gives teachers more 'stuff' to grade. Do you feel that way too? I hope I'm not the only one! Last year I did homework packets that went out Monday and were due Friday. We played Homeworkopoly each Friday where student's won prizes from treasure box and class coupons. You can read more about this here. I liked the procedure actually, especially having homework packets for 1st graders since didn't waste much class time. This year I want to try something different that gives my 2nd graders more independence, responsibility, and choice. After I was first introduced to the Universal Homework Model (UHM) though 3rd Grade Thoughts who posted about it here. I knew I wanted to give it a shot. That cute bookmark on the left hand side is what student's will be taking home. You can download your own customizable bookmark from 3rd Grade Thoughts here. She's fabulous isn't she? I've customized her bookmark a little to make it work for my class. I'm giving my students 4 homework choices that include spelling, math practice, independent reading, and writing a letter to me about whatever they want but it has to be neat and over a half a page. Students can choose to do one star or all 4 stars; it is truly up to them. I'm going to be pushing they do two a night. The bookmark on the right will go on the back of the Star Homework bookmark above so it will be one double sided bookmark. I love how this means they can see their Word Work choices each night with detailed directions. Students will know these activities well since they will be doing them in class weekly but I think it will help in case they need a reminder at home. How will this look in my classroom? Each morning when students enter the class, I'll have them record how many stars they completed on a clipboard and then turn in their homework into a basket right next to it (can't wait to be back in my room so I can show you pictures!!). Then at our morning meeting, I can quickly tally up how many stars our class has earned and there is a record of how many each student has completed for accountability (that I didn't have to do!). If any issues arise we will chat about it at our morning meeting. 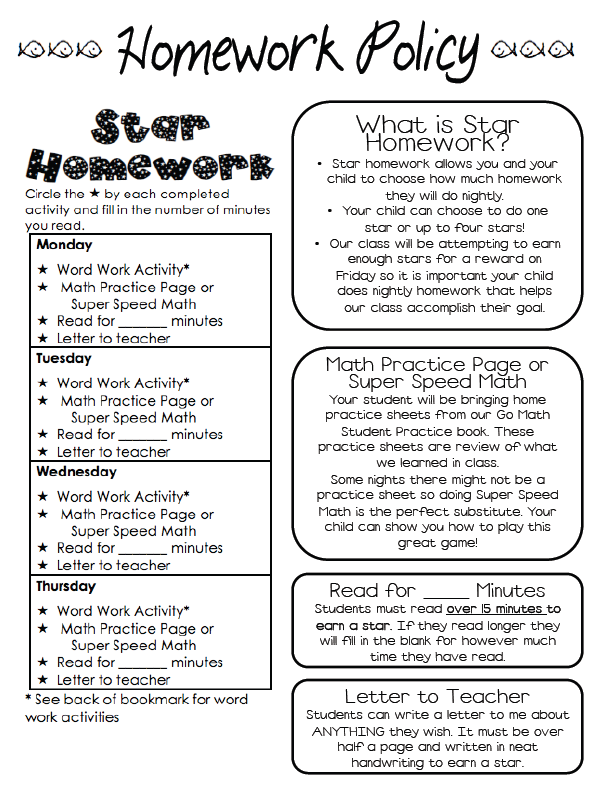 I'll be quickly checking homework sometime through out the day and if any of it is not up to standard they will get their star taken away. These are things I would chat about at the morning meeting. I would never single out that child but just talk about the issue generally. During our morning meeting I'll also remind students we need however many stars to get our goal for the week. For example, if our class earns 75 stars (I'm making this number up right now, depends on your expectations and class size) they might get 2 minutes of free time, extra recess, or Mind Soccer (a whole brain teaching game students go crazy for). 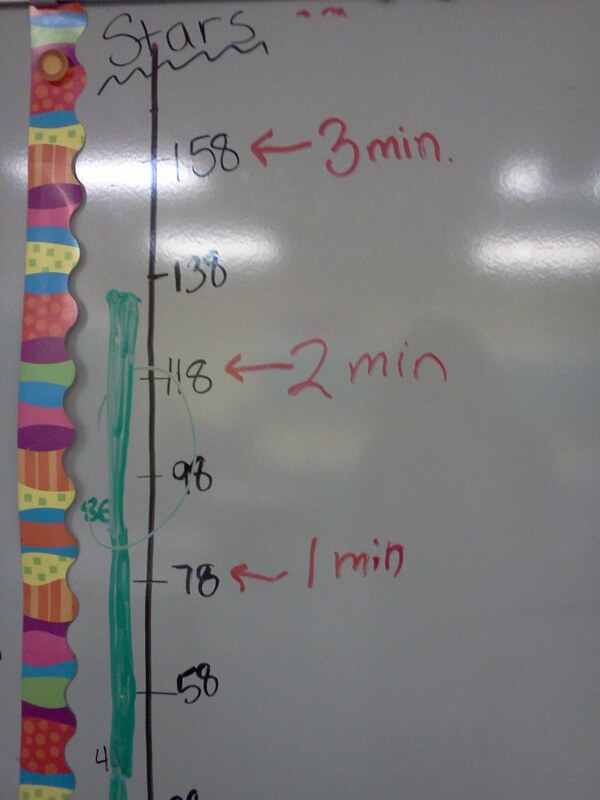 If our class earns 100 stars then students might get 3 minutes of desired activity. Or if our class earns 125 stars then students might get 5 minutes of desired activity! Make sure you keep the desired activity super desired by the students so they want to work hard to obtain it. It's purpose is to keep track of our class total of stars and is a great visual representation. Also have students volunteer to do more stars on Wednesday/Thursday and write their name down on the board. Follow up with them and see if they did complete 3 or 4 star homework and if so celebrate, thank them, and cheer for them. Students love attention and this entire homework program is somewhat based around class peer pressure. The more homework they do, the more attention they will receive! I'm really, really hoping this system works out well *crossing my fingers* I am very excited to give the students choices so hopefully homework is more engaging. Have you used the Universal Homework Model? I have done way too my talking.. or typing.. so now it is your turn. Please share how you do homework in your class or if you have any further questions! Here are documents for you to download! 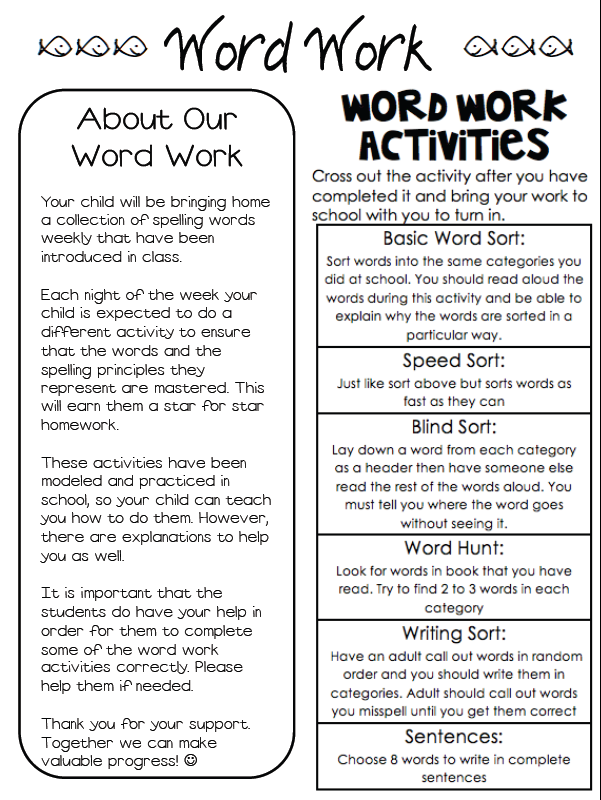 I have a question - if the students are choosing which homework assignments to do, are you still making copies of the spelling sorts & math worksheets for all students or do they have to ask for them? Yes/No, I'll only be making one extra copy for their spelling. For their spelling sorts, I'll give them two copies of their words when they receive them monday. One for class and one for home. They use the words for all the sorts we do and keep them in an envelope. This sounds great. Homework is always one of those horrible things that they maybe need but you don't want to grade. Do you have a place you can download your word work page? I love it! This is great, but do you have a word document so I can make it fit what I do? What a fabulous idea! I love it....I'm thinking of a way to use the SmartBoard with the kids to track their stars in the morning? Hmmmmm...you've now given my brain yet ANOTHER thing to consider! Awesome! I just found your blog & I'm your newest follower!! 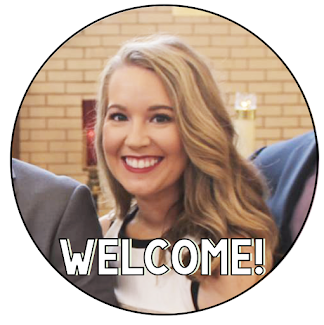 I am excited to follow along & share ideas with each other! I love this idea! I work at a Title school, and homework is often a difficult thing to enforce, but this gives the student an opportunity to choose to be successful. This is amazing!!! I am transition from being a Grade 8 teacher to Grade 3 and was wondering how I would handle homework...now I know. How did this Universal Homework System work for you?? Nice to see your blog new things are discussed here, keep posting the good work..
Love this idea as I am a HUGE lover of WBT and the whole notion. I am ready to delve full force into this but I am in an inner city area with limited parent involvement- I can barely get signed permission slips back. I also have a hw turn in rate that is VERY low- so I am hoping this will be a great self motivation tool. Few questions I am really hoping you can help me with. 1) do u think it can be successful ( honestly) without parent involvement? 2) is it solely on an honor system for sorts and things or do u have them write the sorts and bring them in? A little confused on how it actually works but love the concept. Wonderful artice to read keep posting the good work in future too. I just visit your blog you have shared a good information here in the blog. I've never seen anything like this. Thanks a lot for sharing this info. I was wondering if you had a word document file of the page you will be sharing with parents? I am teaching 5th grade and would need to change it, but I love the ease of it. I love your post. I would like to be able to change the bookmark on the powerpoint to show the custom one that I have made. Can you tell me how to change it? I can't seem to be able to cut and paste my bookmark to replace yours. Sorry, I am usually pretty savvy with these things, but I am stuck on this! Thanks. write my essay am thinking about all of the evaluations are actually put from the site visitors on this web site, quite a few are getting to be effective suggested consider this article. Thanks so much for sharing your knowledge with us! That was a great way to go about education. When you are going for traditional education, you might have to face these issues, but when you are going for a mode which involves online study , you dont need to worry about anything. buy essay papers I'm really, really hoping this system works out well *crossing my fingers* I am very excited to give the students choices so hopefully homework is more engaging. Have you used the Universal Homework Model? Great posting you have shared here keep it up. Thank you very much for these great tips :) Here, students can get exclusive research papers for sale at attractive prices. So excited to try this out next year. I was also using the homework packets each week. I dreaded gathering homework & making copies each week. But I have two questions about this strategy: How would you address a student that is choosing the same stars each night? I feel that some of my students would only choose the stars they enjoyed while ignoring the stars they struggled with (and needed the most practice with.) & What do they turn in/ what is checked for their word work activity? Such type of home work model can also be seen at different writing websites which do homework help to student such as coursework writing from writing tutor UK and others which believes to provide homework help. Teaching a student to write something is an ongoing process. Research paper service will teach the students the correct format and guidelines in writing. "Did I offer peace today? Did I bring a smile to someone's face? Did I say words of healing? Did I let go of my anger and resentment? Did I forgive? Did I love? These are the real questions. I must trust that the little bit of love that I sow now will bear many fruits, here in this world and the life to come. This will be a good guide for parents who taking care of their child. They can understand so many things from this post. They will get a clear idea about completing their home work in different ways. There are academic writing services providing the help for home work completion also.